A school program for K-12 on what chickens and their pecking order teach about bullying. "Chickens are much easier to take care of than dogs or children," said the chicken guru at the Groton Local meeting. I presume he had brought the delicious deviled eggs to the potluck dinner. The baby chicks will arrive in about a month. I'm literally nesting. I need to get some books on how to raise them, build a hen house and gather a support network. I wonder if I need a chicken shower so I can be given all of the accouterments of raising chickens. It's very exciting to anticipate the animals joining our house. At the least, we'll have delicious fresh eggs to eat and share. Already, it's interesting conversation at gatherings to announce, "I'm adopting chickens in March." "You'll have to watch out for predators," came one warning. I will become intimately acquainted with foxes, racoons, fisher cats and other hungry beasts in my pond-side location. It might be interesting to see what and who the chickens attract. I wonder how my dog Gonzo -- black Labrador-mix -- will react. As a girl, my neighbor Michael Sedgewick got a baby chick for Easter. A dog that visited chased the chicken all over the city backyard until the chicken lost the battle of the survival of the fittest. Maybe Gonzo will protect the chickens from predators. Right now, Gonzo is trained to come to the kitchen every time she hears me crack an egg. She hopes she'll get an egg yolk. If I reward her with an egg yolk for protecting the chickens, that could be a motivator. We all have our ulterior motives. BTW-- I mean Chicken Advent, not Chicken AdventURE. Advent is the time before, the anticipation, the building up before a city slicker adopts chickens. Gonzo likes yolks, but do you know what she likes more? CHICKEN MEAT!!!!!!!!!!!!! Watching Gonzo's reaction to chickens will be very interesting and amusing. For more information on the school program Rulers of the Roost: What Fowl Behavior Teaches us about Getting Along, go to fowl behavior. "Susan’s presentation shed new light on the impact of bullying for my students. Mooey’s featherless back was a startling representation of the damage bullying can do. Students saw how chickens bullied the weaker chickens and experienced empathy for the chickens. "The genuine emotion in Susan’s presentation, coming in part from her personal story of being bullied, makes the presentation effective in raising awareness about bullying,which will make students think twice before they bully others or stand by watching someone be bullied." Marian A. Dyer, Social Studies Chairperson, Littleton High School, Littleton, Mass. "Thank you for your time spent with my classes. Six classes is a lot, but your enthusiasm carried throughout the day!" "A school administrator noticed that you have control over the class. If any side conversations started, you immediately picked up on it and asked if they had a question or comment. It’s a very important skill for a speaker, especially when dealing with teens. “I was impressed by the fact that your presentation resulted in the “coolest kid” speaking out about being bullied in middle school. This was huge, especially since he is now looked at as 'cool' in high school." "Fowl Behavior is a high-quality presentation on a topic that needs to be addressed throughout all ages. Susan gave great information that was very interesting for the students." Jeff Scott, health and physical education teacher, Ayer High School, Ayer, Mass. "Thank you so much for your presentation "Rulers of the Roost" yesterday. The children were very excited to meet Mooey the chicken and to hear what you had to say about bullying. They continued to talk about it even after the program had concluded." Paul McQuilkin, Principal, Wyman Elementary School Woburn, Mass. "Middle school students are among the most challenging students to engage, especially if the speaker is a stranger. Susan caught their attention as students entered the classroom, started talking with them about why she brought the chicken to class, and kept them engaged with her stories about being a victim of bullying, slides and of course, Mooey, the chicken. The analogy really made them think about bullying and how they can use their intellect over their instinct. I can't wait to invite her back next year. Lisa Corcoran, health teacher at Chapman Middle School, Weymouth, Mass. "By using the natural social life of a chicken, Susan has opened a door to discussing bullying with children in a concrete, non-threatening way that helps them to become kinder and more understanding. The kids had good conversation about it afterwards." Debi Keller, director The Cheshire Barn (preschool), Harvard, Mass. "The presentation was great--very moving. It made a connection between the similarity between chickens being bullied and how humans are bullied." "I loved the photo of you when you were in high school. It really showed the impact of being different." 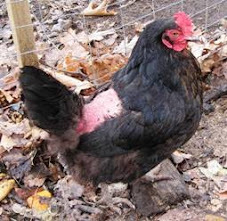 Mooey’s tail feathers were pecked away by her flock during the winter when they were cooped up. Mooey makes a memorable impression to students of all ages. Her plight opens the door for an engaging program and discussion on human and animal pecking orders and bullying. Many students give this feedback: "I liked the live chicken." "It shows that humans are not the only ones being picked on. It's not the normal bullying lecture, so it's different and stands out. Seeing the people who get bullied (Susan and the chicken) shows that people who get bullied aren't alone." "Great visual aids and passion for the topic." "Really interesting and a new approach to the topic. Kids in particular can really connect to it." "It related bullying instincts to chicken instincts of pecking order and people." "Very interesting. Made me think. I liked how Susan applied 'her story' too." "Very interactive. It compares and contrasts the similarities between humans and chickens. It made me have sympathy for the victims. "It showed the connection between chickens and humans during bullying and in all of life." "I liked how Susan compared us to chickens to show us our flaws." "I liked how it was interactive and she worked with us, the students." "Thank you for the presentation." "I liked the use of the live chicken to show the effects of bullying." 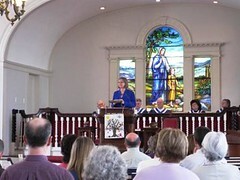 “Susan filled our Sunday morning worship service with wisdom and humor. Framing the discussion of our bullying instincts in terms of chicken behavior helped people approach the theme in a relaxed and open manner. We look forward to having Susan back for a parenting workshop.” --Rev. Cindy Worthington-Berry, Westford, Mass. Rulers of the Roost, What Chickens Teach us About Fowl Behavior is an interactive multi-media program that includes a visit from Mooey, the bullied chicken. The dynamic presentation is customized for each age group from preschool to high school. Contact Susan the Egg-ducator to bring Rulers of the Roost to your school. By email: Susan [at] susantordella [dot] net, telephone 978-772-3930. I am passionate about sharing stories about animal instincts, bullying prevention programs, bystanders, victims and the pecking order. Students of from k to 12 enjoy a visit from Mooey, the bullied chicken, in Fowl Behavior, a bullying prevention school program. My story as a victim of bullying in grades 7 to 11 hits a sweet spot with tweens and teens. The live chicken engages students in k to 12, and stories about the pecking order, photos, and my story. The anti-bullying program rouses students to ask question and contribute. Kids leave the program with a new understanding of how to make a difference in their school community in a preschool, elementary, middle school or high school. At night, I offer a presentation to parents and staff “Teach your Children Well: Stories from a Former Bully Mom” on how to non-violently influence children to make good decisions. Go to www.raisingable.com. This one or two-part program will add harmony to your school community. Go to www.fowlbehavior.net for more information. Chicken advent[ure] 2 -- rolling coop plans?